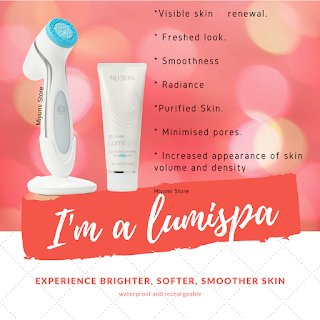 The Lumispa is a new tool from Nuskin Malaysia. This amazing cleansing brush delivers 7 skin benefits to our skin. > Makes visible skin renewal. > Fresh looking skin. > Smooth skin. > Radiance looking skin. > Purified skin. > Minimize pores. > Increase the appearance of skin volume and density. Many users claimed they can immediately feel the difference the before and after wash with Lumispa. You can instantly feel the skin is smoother, softer and brighter. It helps to remove dirt and makeup residue too. The best part is, all you need is to recharge this brush. There is no required of using a battery. You just need 2 minutes = and gained this 7 benefits. Nuskin gives all the members a choice of 6month 0% interest installment plan. Just click for installment and pop, the Lumispa will be delivered to your doorstep with free delivery charge. Wow, wow, wow. What is this new device? This is Lumispafrom NuSkin. It is a cleansing brush that helps to remove dirt, make-up, and residues on your skin. This handy Lumispa brush is easy to operate with just a button. As you can see, the brush head is NOT a brush, therefore personally, I think this is more hygienic and easy to maintain. Many of the first time users found that, within the first wash, they feel the skin is much softer, cleaner and even radiance. For long-term usage, it was proven to shrink the large pores, reduce wrinkles and even lines. You just need to sign up (with a sponsor distributor ID - ASK ME) and starts your shopping with NuSkin. There is no minimum purchase require nor membership fee for the whole life! 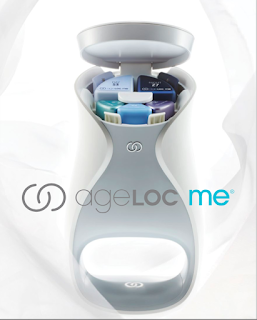 Check this great machine that can customise the need for your skin. How to Purchase Nuskin AP24 Fluoride Toothpaste? Ever wonder how to purchase the best stuff with discounted or distributor price without paying any membership fee? Everyone has the chance to get a great product without paying much such as this effective whitening toothpaste! The great things about Nuskin are , you can make your purchase whenever and wherever you are. Click at this link below to starts register yourself. There are no minimum monthly purchase nor membership fee. Have you ever wonder how to get beautiful and shiny healthy looking hair? It starts with your daily care - shampoo. To sign up as a member, please click ME. There is no minimum purchase or membership fee. It is FREE and you can directly click and purchase your favorite products yourself. 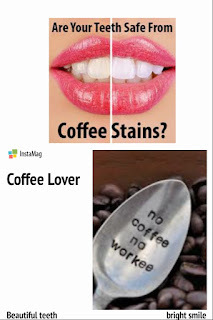 Most of us can't live without a daily dose of coffee to jump start the day, but could the beverage that puts morning smiles on our faces also be making those smiles less brilliant? Well, I'm still enjoying my coffee at 2 cup per day while breast feeding my little precious.. Do you know my secret? I'm using this Whitening Fluoride Toothpaste that I've brought 1 month ago with Peroxide FREE!!! It is so safe to use even you are breastfed your baby. Besides that, I love the vanilla mint formula that freshen my breath that last all day!!! Have you tried yours? OR grab yours now with me!! Are you having postpartum hair loss? This is common happened even to myself. I have a near bold on my left forehead and I am so panic about it. I have tried a few ways to reduce it such as spray the tonic, change to hair fall control shampoo over the counter and lots more. However, it does not help much till I tried out this Nutriol Energizing Shampoo from Nu Skin. 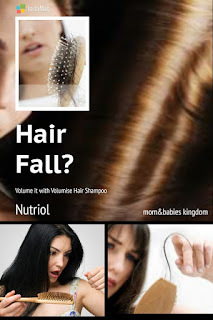 This Nutriol shampoo enhances the vitality of your hair and scalp. It contains Tricalgoxyl - a seaweed derivative rich in polysaccharides, that helps in strengthening and lengthen the hairs in weeks.